What a special recipe. This is a sweet, mildly spicy BBQ Sauce with a fruity huckleberry addition. Works like a traditional BBQ Sauce on the grill or as marinade. Everyone will want your secret. Great as a Dipping Sauce or a Grilling Sauce. A whole new way to create gourmet meals! 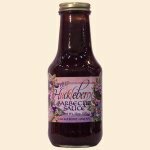 Try our Berry Vinaigrettes to make the whole cook out or family party extra special. Ingredients: Tomato Base (tomatoes, distilled vinegar, corn syrup, salt, onion powder, spice), Wild Huckleberries, Brown Sugar, Worcestershire Sauce, Honey, Onions, Vinegar, Spices.